Shadowman’s first clash with the minions of Master Darque is about to cross the border between worlds and spill into the terrifying way station between our reality and the next… Welcome to the uncanny dominion known as Deadside! Trapped in the Deadside with no hope of rescue, Jack Boniface is on the run from the otherworldly horrors that dwell there. Meanwhile, his new friends and allies are at the mercy of Mr. Twist, whose plan to restore Master Darque is very nearly complete. But Jack is about to find help from some very strange and very unexpected sources… Could a light from Jack’s past could still be shining in the depths of the Deadside’s darkness? Mr. Twist is destroying Dox’s mansion as he tries to kill Jack Boniface. Lucky for Jack, Alyssa manages to take him to the dark side while Doz stays behind to give them time to escape. In dead side Jack and Alyssa are separated. Jack is taken to face an echo of his father as shadowman who gives him a choice of remaining free of the Shadow Loa and returning home to a normal life, resulting In Alyssa’s certain death. Jack chooses to embrace his destiny as Shadowman to save Alyssa. Back in the real world Mr. Twist informs master Darque that Dox may hold the key in opening a door from earth to Dead side setting him free to destroy the world. Cover- Alyssa and Jack take center stage on this one ladies and gents while Mr. Twist, the denizens of dark Side are relegated to background status. The Colors by Brian Reber are near perfect on Alyssa’s milk chocolate skin tone. 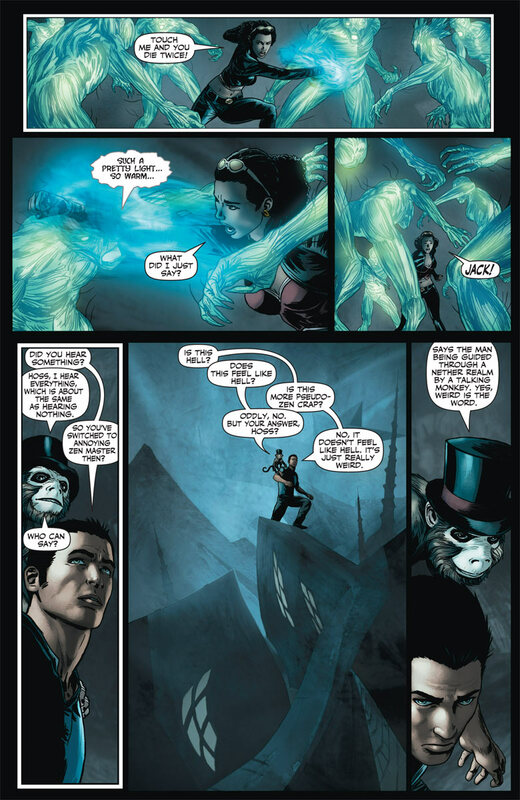 Shadowman Legacy– I’m very interested in seeing more of the other Shadowmen before Jack and Josiah. There is so much potential for the stories that could be told there it’s not funny. Fan Service- Deadside making a huge comeback is a huge nod to those who played, owned or know of the acclaim era of Shadowman. Mike Leroi I still remember you my brutha! 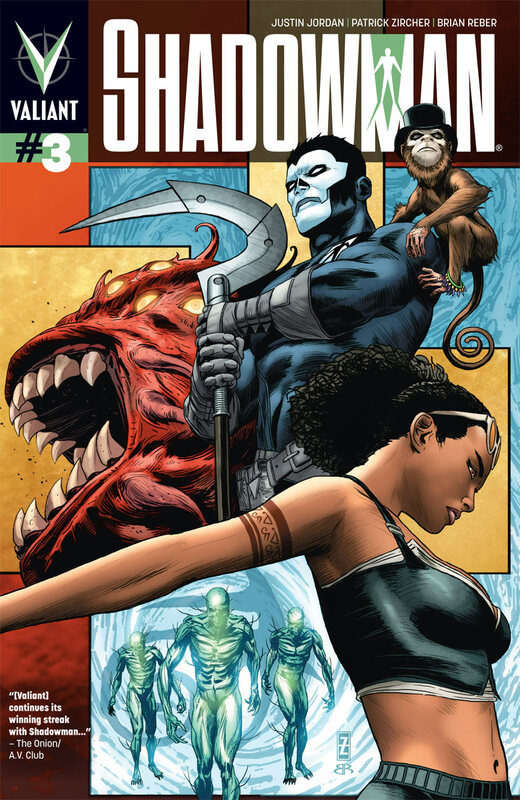 Black Heroes- This issue we have Josiah Boniface/Shadowman, Jack Boniface/Shadowman and Alyssa mistress of the cold flame. Good times ahead if this book manages to remain going for years to come, so much can be done with this band. Tension- This issue had a pervading sense of heightened tension as Jack and Alyssa fled from Twist and then Jack raced to save Alyssa in deadside. Kudos on ramping things up Justin Jordan and Patrick Zircher! Art- For the most part Patrick Zircher’s art is visually pleasing especially in action heavy scenes and when rendering any of the Shadowmen. Inconsistency– The art looks good at first glance but fails to impress when placed under a microscope. Page thirteen is a prime example. Dox is pinned on an X shaped cross, his head is painstakingly detailed and colored then as you look at his chest and legs it becomes less detailed and almost blends into the background. Minor nitpick considering this book is arguably one of the best looking “Indy” books outside of DC and Marvel but this lack of consistency constantly holds them back from being in the same bracket as their mainstream counterparts. Master Darque- Sorry guys but you’ve not sold this villain just yet. Sure Mr. 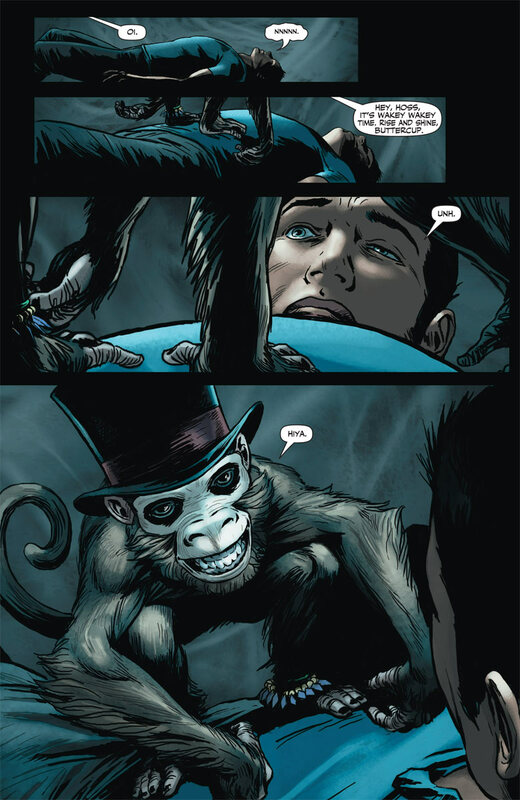 Twist is scary and all but it doesn’t fill me with dread thinking of his master being free from “prison” in deadside. Perhaps they should take a gander at Buffy Season 5 at how Joss made Glory a god trapped in a human prison seem like a world ending threat without us ever witnessing said power. Darque just doesn’t have the same effect, and I’m saying that having read (and own) the entire Shadowman run (Original, Acclaim) and this and having witnessed the power of the original master Darque (I wonder if his sister will show up in this new series?) New readers must be wondering what’s the big deal? Zircher and Jordan need to sell me the threat to add tension for this eventual escape. Right now I’m not feeling it at all!